I first became enamored with the silver screen in university. I majored in cinema studies at the University of Toronto when the program was in its infancy. I have to admit that of all the things I have studied in an academic setting, cinema studies has been the one with the most practical value. Magicians have always had a symbiotic relationship with cinema. Some of cinema’s earliest practitioners—Méliès, for example—were also prominent magicians. Also many actors and directors, from Woody Allen to Orson Welles, have dabbled in magic. I started integrating film and video with magic into my performances—both private and public—many years ago. My first public incarnation that made it a featured component was Natural Magick for Luminato. Next, I explored the power of projection to augment on-stage activity in Card Table Artifice, also for Luminato, when I had the wonderful opportunity to work and perform with Gavin Bryars, the noted composer. I picked up this thread again last year with Tricks at Soulpepper where we used the screen, and Cam Davis’ video artistry, to create the scene or context for each piece. Now, for Hocus Pocus, I revisit that material once again, but with a direct link (or indebtedness) to my cinema studies at university—and, in particular, two films, The Cabinet of Dr. Caligari and Michael Snow’s So Is This. For me, the classic, silent horror film, The Cabinet of Dr. Caligari, inspired two queries for me: Was there a ‘cabinet’, and if yes, what did it look like, and more importantly, what did it do? To me, the answer is a modern-day illusion (created by Robert Harbin) called the Zig Zag—an illusion that has fallen out of favour with today’s performers, even though it still has, in my mind, the power to amaze. 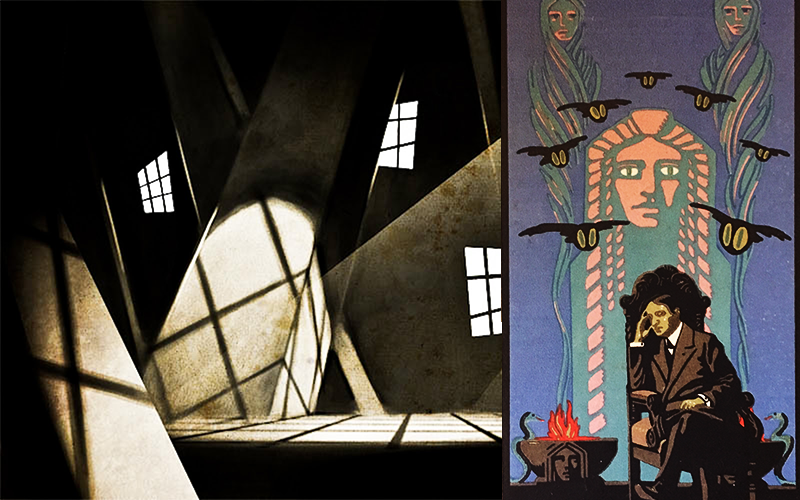 The Cabinet of Dr. Caligari was shot in black and white so it did not capture the colours of the German Expressionistic movement—colours, which I have seen from the posters and ephemera of the period, specifically the material of a German performer Chevalier Ernst Thorn. So in Hocus Pocus, you will see a modern-day illusion inspired by this pivotal film, live and, as they say, in glorious colour. I saw the second film, So Is This by Michael Snow, in an avant garde film course taught by filmmaker Kay Armitage. Snow’s film left an indelible mark on my psyche, and has remained in my subconscious mind all these years. The Snow film is made up entirely of words and they are projected one word at a time. It is, in many ways, Spoken Word because of the way Snow “directs” the words—the timing, the rhythm, the size of the letters—and it forces the viewer to read the words as they appear on the screen. I decided to couple this technique with one I learned from Gavin Bryars—the concept of audible misdirection. For Card Table Artifice (actually, for its precursor, A Man In A Room, Gambling) Bryars told me he intentionally composed a banal passage followed by one of great beauty and lyricism as a counterpoint, but more importantly, as auditory misdirection, to pull the listener’s focus from what may—or may not—be essential information. So in Hocus Pocus, I will attempt to do just that. Perform a piece that I have been working on for decades—a shopworn feat of conjurors for the past hundred years—paired with an explanation of the feat, one which the audience can read, one word at a time, juggling where they want to focus their attention—on the performance or on the explanation, as they, or I, deem fit.